Advice from your Manahawkin NJ Dentist Dr Robert Young, first aid for your teeth. A dental crown just fell out. It hurts, and you are embarrassed by it. Call your Manahawkin, NJ dentist, Dr. Robert Young, to learn how to help that tooth. Dentistry involves more than x-rays, hygienic cleanings and root canal therapy. Sometimes dental situations need quick, action and advice to resolve. The process begins at home. 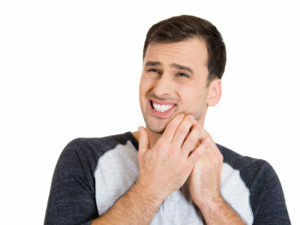 Learn about home first aid for your teeth. Sometimes, however, surprising situations arise. A car accident, sports injury, fall on winter ice–mishaps knock out teeth or lacerate soft oral tissues . What do you do? Always call Young Dentistry first for non-life threatening emergencies involving the teeth, gums, tongue, or jaw. Dr. Young and his staff will schedule an appointment if warranted or to advise you on what to do. Then, consider these injury scenarios so you know what to do right away. A fall knocked out a tooth. Rinse dirt and debris off the tooth, leaving any soft tissue in place. Put the tooth in the socket, and hold it there while transporting to Young Dentistry. You can also place the tooth between the cheek and gum or put it in a sealed plastic bag with milk or over the counter tooth preservative. The American Association of Endodontists states that the sooner the tooth is treated, the better its chances for recovery are. You have a bad toothache. You could have a dental abscess related to decay. Dr. Young will see you to decide on treatment. In the meantime, apply ice or a bag of frozen vegetables to your aching jaw. I chipped my tooth on peanut brittle. If you fracture a tooth, save the pieces, and ice the area. Call Dr. Young for advice and an urgent care appointment. Chips and fractures may be repaired with composite resin bonding, porcelain veneers or crowns. My crown fell off. Try to put it back in place. If unsuccessful, put it in a small plastic bag or clean handkerchief, and bring it to your Manahawkin, NJ dentist. Cover jagged tooth edges with orthodontic wax. I was in a motor vehicle accident and cannot close my jaw together. Your jaw may be fractured. This is a medical emergency. Transport to the local hospital ER. Dr. Young and his team want good communication with their patients. When you have questions about your oral health, contact the office for advice or an appointment. Comments Off on Advice from your Manahawkin NJ Dentist Dr Robert Young, first aid for your teeth.